Don’t preheat oven quite yet. Line an 8 inch square metal pan with foil. Spray the foil with cooking spray or just line with nonstick foil. Pulse flour, powdered sugar, cornstarch, and salt in food processor. Add butter, then pulse until coarse. Pour mixture (it will be very dry) into lined pan and press over pan bottom. Refrigerate for 30 minutes. While it chills, you can make the filling. Preheat oven to 350 degrees F. When oven is preheated, bake the pre-chilled crust (above) for 18-20 minutes or until edges are very lightly browned. Filling: Lightly beat the eggs, sugar, and flour together in a bowl -- you can use a whisk or a fork. Add lemon zest, lemon juice, half and half, and salt and mix well. Reduce oven temperature to 325 degrees. Stir filling again, then pour filling over the crust. Bake for 20 minutes or until filling no longer appears wet and shaky. Set on a wire rack and cool to room temperature. 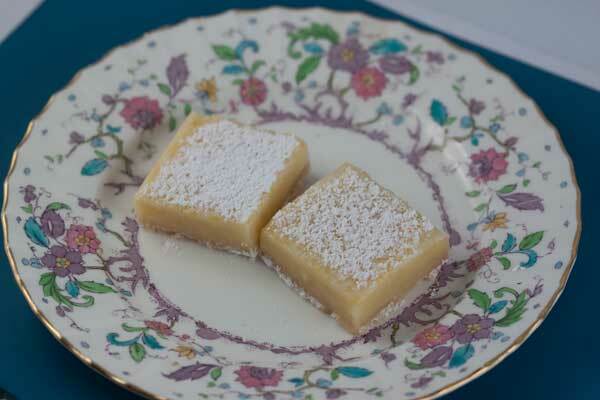 Lift from pan, place on cutting board, dust with extra powdered sugar and cut into bars.